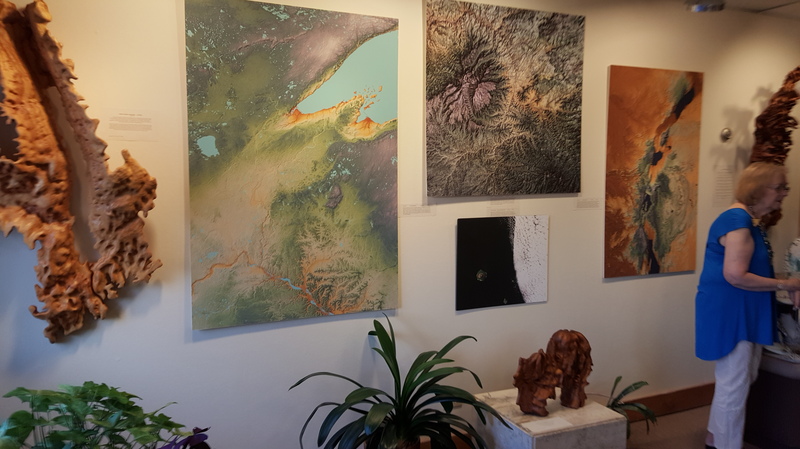 Today in Syracuse, New York, the weather took a nosedive into frigid dead-of-winter temps, but inside the Edgewood Gallery, ( 216 Tecumseh Road, Syracuse, New York, 13224) the landscape is vibrant, warm and creatively cozy. 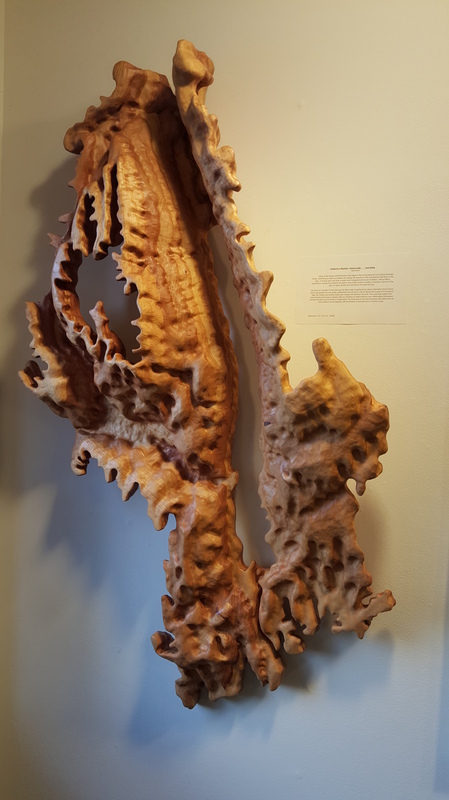 Proprietor Cheryl Chappell has curated “Nature of Things”, a delightful show of oil paintings, ceramics and jewelry, which will be on exhibit and for sale now through February 22, 2019. The art reception was tonight with two of the four artists in attendance. 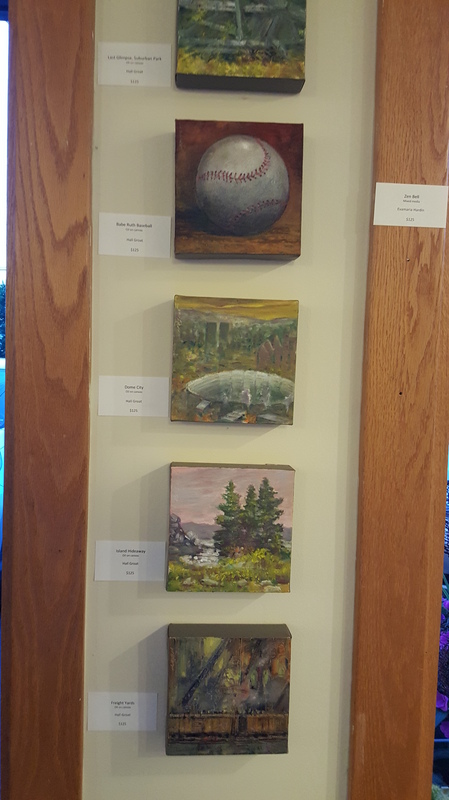 Rob Glisson‘s landscapes in oils are the stars of this show – several of them sported red sold stickers within the first hour of the opening. He starts the work as plein-air pieces then takes them into the studio to re-envision them as fantasy worlds contemplating shadows while paying attention to color, volume and depth. He concentrates on creating worlds that tell a story inviting the viewer to lose themselves within the frames. I am a huge fan of his work and it is such a pleasure to see so many pieces hanging salon style alongside the lovely cow-dominated oil paintings of fellow artist Adriana Meiss. 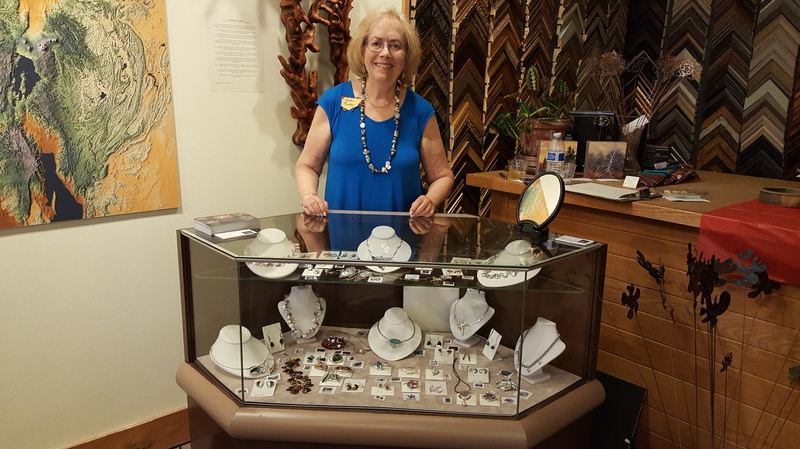 Jan Navales pinch-hit for Dana Stenson tonight, offering visitors information and guidance in selecting for purchase some of the silversmith’s latest creations. This show is comprised of Clare Willson’s whimsical mixed-media pieces combining metal found objects with a painted under-structure, Arlene Abend’s metal sculptures and copper jewelry, Talking Trickster Studio’s pottery by Amy Komar and Sheila Roock and Terry McMaster’s abstract art. Clare sold four small pieces before she even arrived for the opening, which is so great and worth the wait. Cheryl Chappell, gallery owner, curator and framer extraordinaire, books her artists well in advance, sometimes as much as five years in advance! It is really very impressive how each exhibition is so different from one another, and each pairing of artists works so well together. That, combined with the punch Cheryl packs in terms of breadth of works fitting so nicely in the space, the great spread of wine, grapes, hummus, crackers and Brie, and the always amazing conversations with all my cool artsy friends, made for a great time! Clare’s boyfriend bought her one of Arlene’s fabulous necklaces. Arlene Abend always surprises me with something new. Although she prefers to work in steel (“I hate copper – it doesn’t fight back” was what she said with a smile on her face), the copper jewelry appears simultaneously delicate and strong (or feisty more-like, lol). Arlene is such a spit-fire. I just love her to death. I am always telling my students the story of how she was in art school, took a metal-smithing course on a whim and fell in love with it. You never know where art will take you is the point of that story, and a result of Arlene’s journey are these wonderful reasonably-priced pendants and pins. Amy Komar is another one of my Facebook friends who until last night, I hadn’t actually met. As with social media though, we seemed to know a lot about each other and ended our conversation by hugging it out. I loved her positive energy! She glazes the collection of pottery while her Talking Trickster Studio partner Sheila Roock is the wheel-throwing expert. Many of the pieces are created in porcelain with a fun-loving cat-(dog? no whiskers so…)man and other whimsical imagery decorating the surface. I believe these pieces may be cash and carry while the wall art will remain on display until the take-down date of September 23, 2016. I met Terry McMaster for the first time Friday night. Lol, I didn’t get a selfie with him – oh well, next time! He is known for his photography – I purchased a print from a basket of cards he was also selling. These new paintings are somewhat of a departure for him. He agreed to a future exhibition in the library gallery at Chittenango Middle School. I am looking forward to working with him in the future! Exciting. Call Cheryl Chappell at (315) 445-8111 for more information including the contemporary art and frame shop’s hours. Check out the web-site too! The Edgewood Gallery is a teeny little place, about the size of my living room with only two walls of space in which to exhibit art. But I have to say, gallery owner and framer extraordinaire, Cheryl Chappell really knows how to pack an artistic punch. I was crazy busy this weekend. 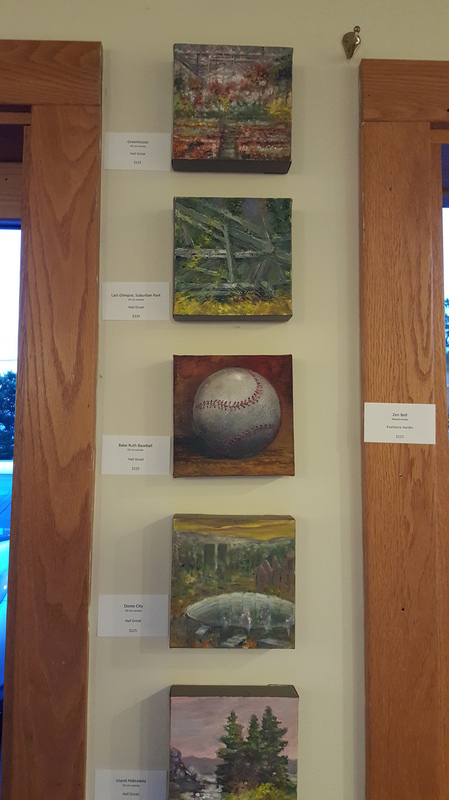 On Friday, I installed my art exhibit at Natur-Tyme, attended my sister’s garage sale, exercised, wrote the blog post about my show and finally got around to going to the artist reception at Edgewood. It was from 6 – 8 pm and I squeaked in at 8:30. A handful of people were still there including Hall Groat who creates breathtaking oil paintings. He is selling tiny square pieces – maybe 6″ x 6″? for $125 but they are worth every penny. He has such a masterful technique. They are perfectly worked little canvases. My favorite one is the little baseball. Groat visited my school ages ago when I had this Visual Artist series at Bridgeport Elementary. I would get three or four artists a year to come to the school library and give two presentations – one to all the 4th graders and one to all the 5th graders. The series had been sponsored by the defunct State Bank of Chittenango. I asked the bank president for grant money every year to pay the professional artists around $100 for their services. Groat created a baseball painting as a demonstration that I still have somewhere. I think I had it framed and it is still at the elementary school. He didn’t remember me when we spoke at this reception. No doubt my ego was a bit bruised, lol. Back then I remember him telling me how he had eeked out a living as an artist by being a go-getter. He’d created murals at the old Syracuse Savings Bank in downtown Syracuse by telling them he knew how to do it even though he had never done it before – the kind of amazing confidence that many of us spend our whole lives chasing. Now Groat works alongside his mini-me, Hal Groat II. They have a mutual website where, among other things, they interview other successful artists via offering them questions to respond to. He proceeded to demonstrate this on me, which was pretty hilarious. Jay Hart creates these large-scale “geographic compositions”. They are mounted on foam board – not sure how they are attached to the wall. 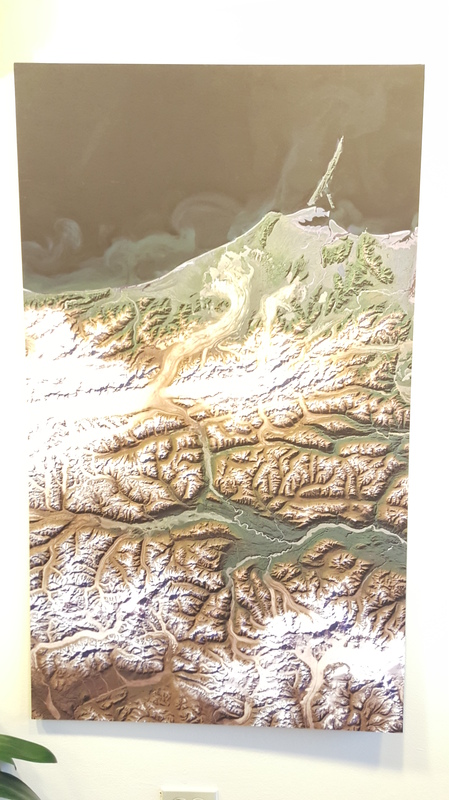 Very interesting textured topography! I’m not sure my Samsung Galaxy 6 phone camera do them justice. They are a bit more colorful in person. At least I was able to take photographs. 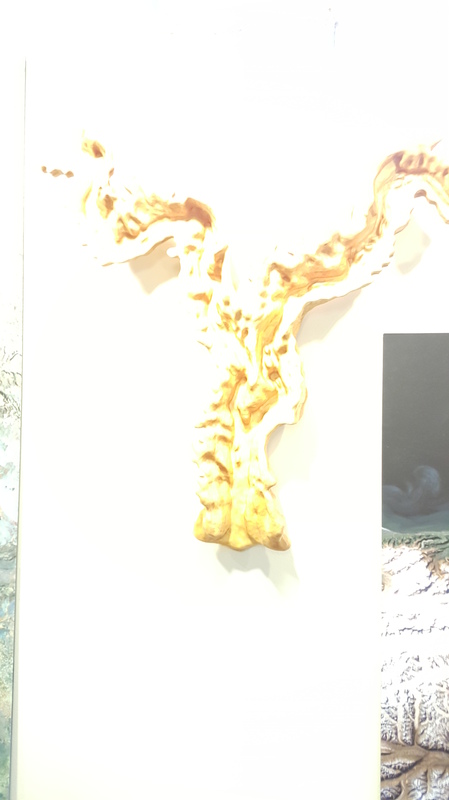 The last time I attended an opening at Edgewood, it was so crowded with so many of my art colleagues that I spent the whole time talking – no pics to show for it and of course, I didn’t write a blog post on that show. It was nice to be able to see the work from at least a five foot distance and the lucky thing for me was that even after hours, some of the artists were still there. Vicki Thayer was selling hand-made jewelry. I was particularly impressed with the keshi pearls. They looked a lot like Honora pearls but her color combos were more brilliant, I think. She said that soon no one will be able to get these pearls in these colors (they kind of look like pieces of Corn Flakes in shape), because they take years to manufacture. Obviously they are a specific type of oyster – so when I say manufacture, these oysters are farmed but the process is all natural. Even with that said, Thayer’s prices are so reasonable – a pair of earrings for around $40 and the ability to compliment them with a matchy-matchy necklace. 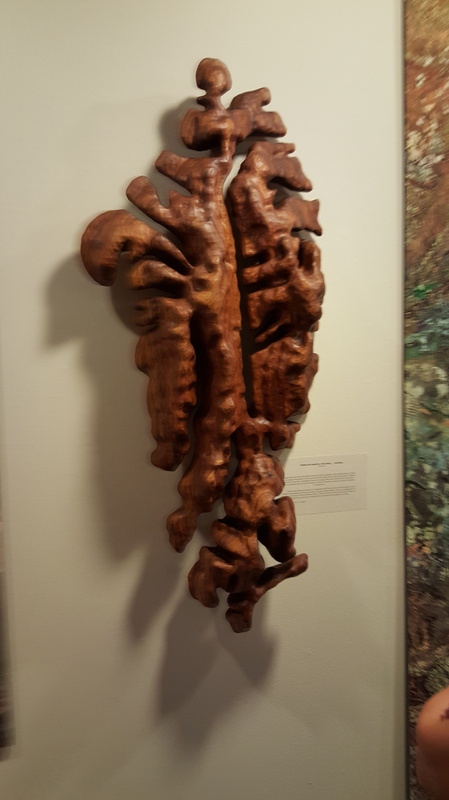 Finally, probably my favorite of the group – these impressive wood carved anamorphic wall mounted sculptures by June Szabo. They reflect the idea of nature. One of them was supposed to be a delta and two rivers but my dirty mind thought I was looking at Fallopian tubes, like in the 7th grade Health textbook. I’m a dork. John Franklin is also exhibiting. 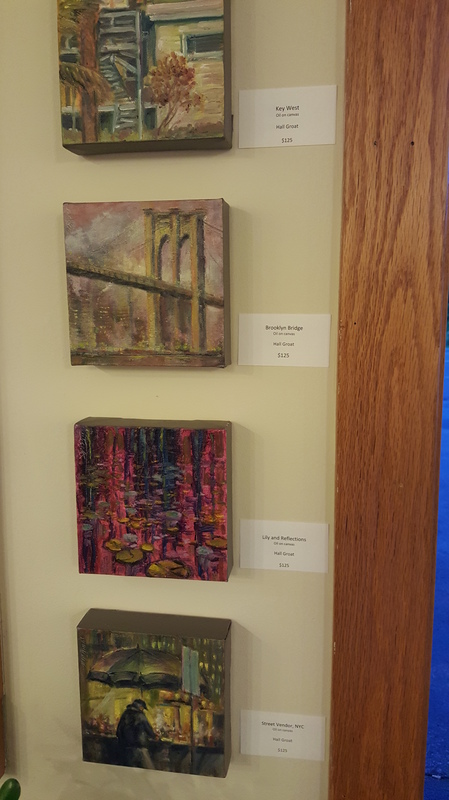 The Edgewood Gallery is located at 216 Tecumseh Road, Syracuse, NY. Gallery hours are Tuesday-Friday 9:30 am – 6 pm, Saturday 10 am – 2 pm. And this show, entitled Beneath the Clouds, continues through August 28th, 2015, so there is lots of time to see it! #ootd #theory cashmere cardigan #bcbgmaxazria romper #joie sandals #instafashion #lovefashion #fashioninrealtime #fashionintherealworld #fashioninreallife #syracuse #artist #artteacher #syracuseartist www.karentash.com #fashionista #fashionrules #fashionblogger #fashion #blogger #stylechoice photo cred Kim M.